Please excuse this blurry iPhone photo. Although I ate one hundred of them in one week, it seemed every time I was served shishito peppers in New York, it was at night and I might have had a drink or two before aiming my mobile camera. But poor or not, I had to show you this photo so you’d have a better chance of finding Japanese shishito peppers. They’re a little spicy but it’s a slow heat, sort of like a serrano chili but much milder–though every once in a while I bit into one with a lot more heat than the others. 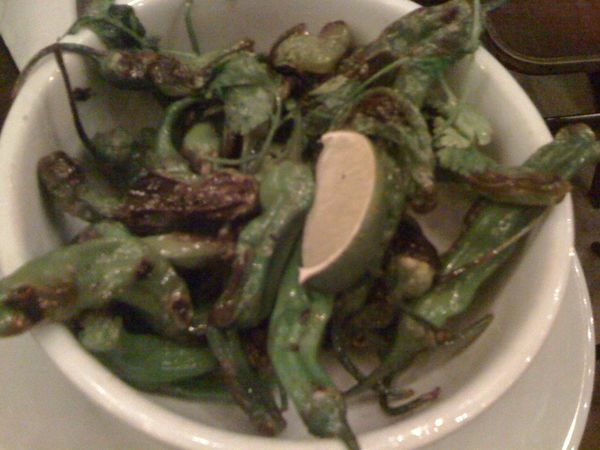 They taste a little like a cross between a serrano and a jalepeno, with looks to match–not super thin or pointy, not fat either. I had them deep fried with yuzu salt at Ippudo and pan fried with cilantro and Persian lime at Five Leaves (my favourite of the two). I want to try them grilled, breaded, raw, sautéed and every other way imaginable but first, I need to find them. I called one Japanese grocery store and they said “Yes!” They carry shishitos! “Oh but, no. No, not this week.” Apparently these have been trendy and on many menus in New York last fall. If they aren’t all the rage in your town yet, start asking for them. Maybe you and I will eventually find raw shishitos so we can enjoy them at home, but it can’t hurt to hedge our bets. Ok, I am hooked. I just ordered some shishito seeds to plant in next year’s garden. (Solana seeds in Quebec carries the seeds).